I’m continuing the trend of drinking good wine when I get it rather than holding it in hopes of a bigger celebration. The November 2014 shipment of Count’s Club selections from Buena Vista has not been here long and I’m just pulling corks as the mood and opportunity presents. These wines ARE the occasion–know what I mean? 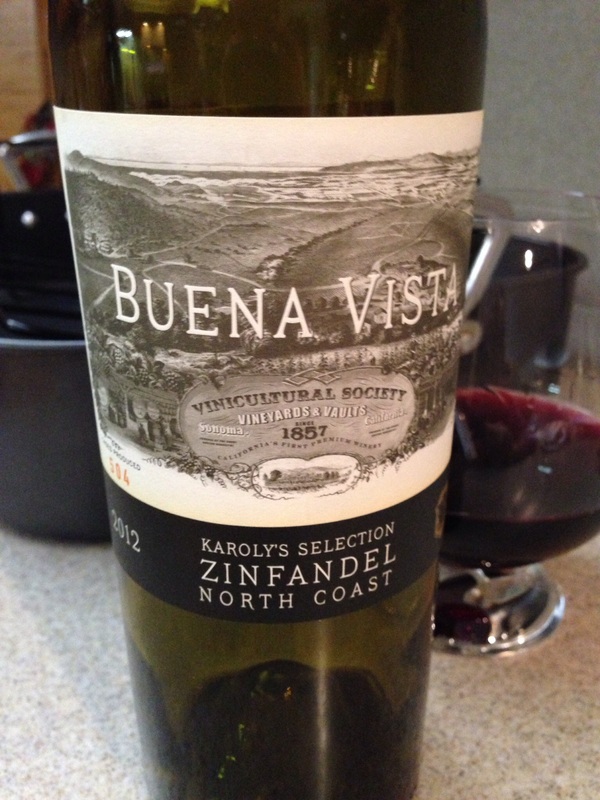 2012 Karoly’s Selection Zinfandel North Coast, Buena Vista, California, USA. Tomorrow is Thanksgiving, so the meal tonight is not the main event. Know that we’re not starving, to be sure, but rather looking forward to a food experiment with a turducken and some of our favorite holiday food traditions. Not all of ’em, but enough to keep the day fresh for us. Speaking of fresh, let’s talk about the 2012 Karoly’s Selection Zinfandel. It’s a power-packed Zin that brings its A game right from the start. You don’t need to decant this bad boy; we poured in nice glasswear and just sipped contentedly. The best wines are either eagerly or contentedly consumsed, right? This one is a mix of both and infuses some interesting berry tastes and smells folded into this Zinfandel wrapper. Well said. A great wine, and an even better description from Buena Vista.